Results of Monte Carlo Simulations in Klein (2015b) for 40 two-group markets. Benchmark study, OLS: coefficient estimates for 40 markets with groups of 5. Data for all 5 group members is observed. Experiment 1, OLS: coefficient estimates for 40 markets with groups of 6. Only Data for 5 group members is observed. 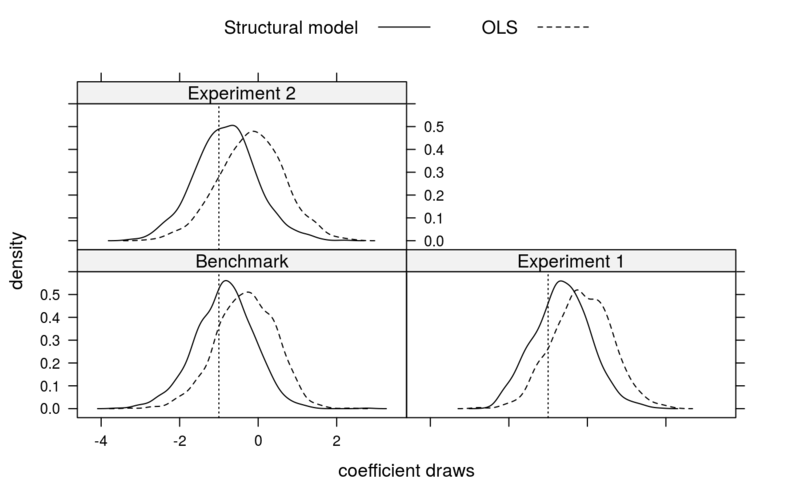 Experiment 2, OLS: coefficient estimates for 40 markets with groups of 6. Data for all 6 group members is observed but only a random sample of 250 of the 922 counterfactual groups is used in the analysis. Klein, T. (2015b). Analysis of stable matchings in R: Package matchingMarkets. Vignette to R package matchingMarkets, The Comprehensive R Archive Network.